The largest component of the thalamus in anthropoid primates is called the pulvinar, a structure composed of several major divisions, usually termed the inferior, lateral, medial, and oral (anterior) pulvinar nuclei (Gutierrez et al., 2000). This terminology is generally not used in nonprimate mammals, although it is clear that at least some components of the primate pulvinar have homologues in other mammals. The anterior pulvinar of primates is related to the somatosensory system, and may be homologous to a portion of the posterior thalamic nucleus of rodents. The inferior pulvinar (including the inferior part of the lateral pulvinar nucleus) is the major target of projections from visual structures (superior colliculus, primary visual cortex) in primates. This inferior region is probably homologous to the largest part of the structure designated as the "pulvinar" or "pulvinar-lateral posterior complex" in other mammals, which is characterized by similar visual connections in other mammals that have been studied, including tree shrews, rodents, rabbits, insectivores, and carnivores, at least (for reviews, see Diamond, 1973; Harting et al., 1972; Huerta and Harting, 1984). 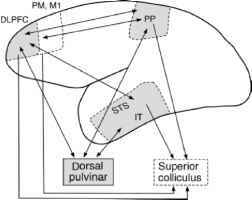 Collectively, the anterior somatosensory and inferior visual regions account for all or virtually all the pulvinar of nonprimates, but in primates there remains a large dorsal (or superior) pulvinar region, consisting of the traditional medial pulvinar nucleus and the dorsal part of the traditional lateral pulvinar nucleus (Gutierrez et al., 2000). In contrast to the inferior pulvinar, the dorsal pulvinar is notable for its lack of strong inputs from the superior colliculus. Studies in anthropoid primates have shown the dorsal pulvinar to be connected with an astonishing array of cortical areas, spanning the mantle. Its strongest connections are probably with dorsolateral prefrontal, posterior parietal, STS, and IT cortex, although it is also connected with limbic cortex (including posterior cingulate, parahippocampal, and insular cortex) and with higher-order visual, auditory, and somatosensory areas (see especially Goldman-Rakic, 1988; Gutierrez et al., 2000; Romanski et al., 1997; Selemon and Goldman-Rakic, 1988). A number of cortical areas that are connected with the dorsal pulvinar are themselves interconnected: for example, there are strong connections between dorsolateral prefrontal, posterior parietal, and STS areas (Figure 8). Prosimians have a suite of pulvinar subdivisions similar to anthropoids (Glendenning et al., 1975; Simmons, 1988; Weller and Kaas, 1982). There are few published data on dorsal pulvinar connections, but the studies of Raczkowski and Diamond (1980, 1981) demonstrate connections with posterior parietal and temporal association cortex. Also, tracer injections of pre-frontal, posterior parietal, and STS cortex made by Preuss and Goldman-Rakic (unpublished observations) yielded strong labeling of the dorsal pulvinar. These injections also demonstrated strong interconnections among the higherorder cortical areas (Preuss and Goldman-Rakic, 1991c). Figure 8. Primates are distinguished among mammals by the presence of strong connections linking higher-order frontal (DLPFC), parietal (PP), and temporal (STS, IT) cortical regions. These regions are connected with a common thalamic structure, the dorsal pulvinar, which appears to be unique to primates. These higher-order cortical regions, along with forelimb representations in premotor (PM) and primary motor (M1) cortex, also send strong projections to the superior colliculus; comparable projections do not exist in nonprimate mammals. and collicular inputs, connections with far-flung, often mutually interconnected, cortical areas). It is very likely that both the dorsal pulvinar and the transcortical networks of which it is a component are unique to primates. Although expansion of the pulvinar has been cited as a hallmark of primate evolution (Harting et al., 1972; Le Gros Clark, 1959), what is really distinctive about primates is the dorsal pulvinar. The remarkably extensive cortical connections of the dorsal pulvinar place it in a favorable position to influence, and possibly to coordinate and integrate, activity over a very large fraction of the cortical mantle. 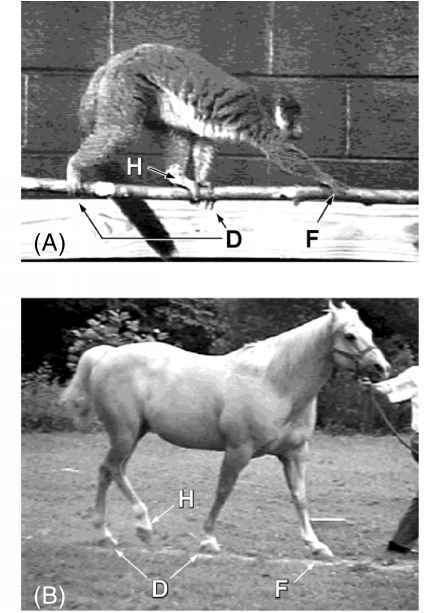 Despite this, experimenters have devoted little effort to understanding the functions of the dorsal pulvinar. There is some evidence that it plays a role in selective attention, especially in the spatial domain (e.g., LaBerge and Buchsbaum, 1990; Petersen et al., 1987). Connectional studies have prompted similar conclusions, because the prefrontal and parietal areas that have such prominent pulvinar connections are also believed to have attention-related functions (Gutierrez et al., 2000; Romanski et al., 1997; Selemon and Goldman-Rakic, 1988).